Art Deco is a design movement that flourished from the 1920s to the 1940s with an emphasis on sharp, geometric lines and imagery celebrating the arrival of the Machine Age. 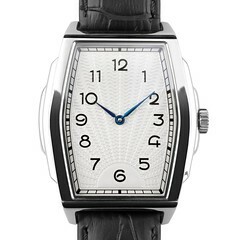 We have incorporated the most characteristic elements of this period in the design of our Art Deco watch. In keeping with the angular aesthetic of Art Deco, watches from the period were more often made with rectangular cases, instead of circular. The stepped case is reminiscent of Art Deco skyscrapers. When New York enacted the first zoning law in America in 1916 to regulate the construction of skyscrapers, it mandated that the front walls of buildings at the street line be limited to a specified height. Above that height, buildings were required to be set back behind an inclined plane, allowing sunlight to reach the street. 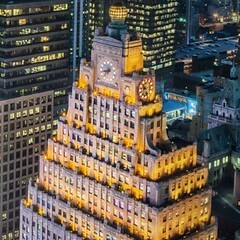 Architects responded by designing the upper levels as tiered steps, as can be seen on the Paramount Building, among many others, and thus setbacks became a defining characteristic of Art Deco architecture. Egyptian and Mayan pyramids were also an influence, as archaeological excavations such as the 1922 discovery of the tomb of Tutankhamun fuelled the public's fascination with ancient and exotic cultures. The watches of the Art Deco era were much smaller, on par with today's womens watches. In order to fit the mechanical movement into such a small case, watchmakers employed protrusions on the side of the case. 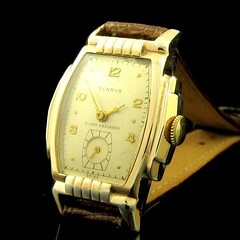 Just as stepped architecture was a design made out of necessity, so were the stepped cases of Art Deco watches. The dial was designed by Louise Fili, author of Euro Deco: Graphic Design Between the Wars and several other books on Art Deco. The numerals are hand-lettered in her signature style, just as watches from the Art Deco period often featured specially commissioned fonts. We have previously collaborated with her on our Monogram W pocket square. The sunburst is a common Art Deco motif representing exuberance and optimism in the Machine Age. 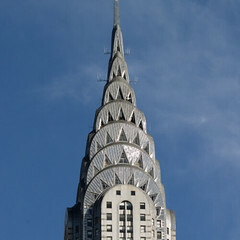 The Chrysler Building, considered the finest Art Deco skyscraper, prominently features a sunburst crown, which is also showcased on our Chrysler Building tie clip. The sunburst design is guilloché engraved, a technique in which a metal surface is cut with an intricate repeating pattern by a hand-operated rotating tool known as a rose engine. This technique is also used on our guilloché enamel cuff links. Automatic movements were not invented until the end of the Art Deco era, and it took several decades before they became common. In keeping with this, we employ the Sea-Gull ST17 manual wind movement. Manual movements are thinner than their automatic counterparts, which allows us to keep the case at a svelte 8.8 mm thickness.